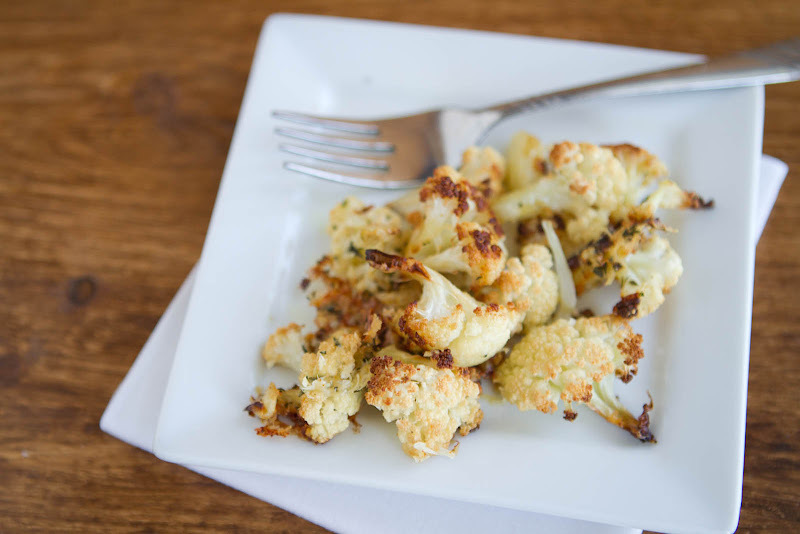 Roasted Parmesan Cauliflower | Naturally. School ends in a two weeks and I still have papers, projects, and concerts out the wah-zoo to finish. Moreover, I passed all of my exit exams so in all reality- I feel like I should be done. I’m antsy (but of course, this is no surprise.) As for what I’m doing after I finish school- that is a different beast. I’m keeping my fingers crossed for potential exciting news but that has to wait. My poor kitchen has been neglected for at least a week but luckily I’ve had a stock pile of recipes from when I was a cooking fool a few weeks back. I have this love for roasted cauliflower. I would roast cauliflower and dip it in hummus or if I was craving something a little less “healthy” I would make baked/breaded cauliflower and dip in ranch. For some strange reason, I love cauliflower. Cut cauliflower down into small-ish pieces and toss with remaining ingredients. Spread out onto a baking sheet covered with parchment paper and bake for 15 minutes. Stir and continue to bake for another 10-15 minutes or until cauliflower is lightly browned. I also love cauliflower, and roasting is the absolutely best technique for cooking it! I love the crispy brown edges :). I love roast cauliflower too. I loved them so much that I tried (unsuccessfully) to grow them. No point in gardening blues though when they are so cheap and big from the market. I carried a monster of a cauliflower home today in my bag. I haven’t weighed it but it must be close to 2 kg! I cooked a quarter of it tonight for dinner (and we have leftovers for lunch tomorrow) and I’m guessing there’s 3-4 more dinners to be had with it. Such good value at about $1 US per cauliflower. 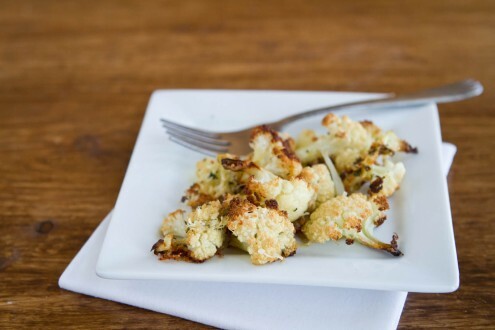 Cauliflower and parmesan do make a lovely combo! And ROASTED! Even better! The Honey did not like cauliflower. He does now. I’ve been cooking cauliflower more or less like this for quite a few years now and a few efforts to “tweak” it have taught me that you really can’t improve on what is basically a perfect “recipe” or combination of ingredients! As if further proof was needed, my once cauliflower-hating (and “too old to change his mind”) Honey/Hubby now considers this to be one of his favorites ~ even birthday dinner worthy! The only reason why I don’t usually make it for / on his birthday is because I pretty much make it EVERY WEEK already! Thanks for sharing. I am a lover of cauliflower. Saw this recipe and gave it a try. I was delighted. The saltiness of the cheese mixed with the oil and garlic made this dish extra special. I am considering a bit more garlic next time. Yum!